Google Instant Preview is Live! 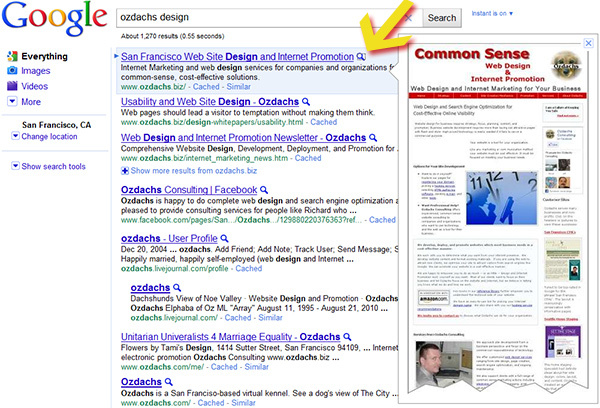 Have you ever wanted a quick preview of a web site in Google’s results list? Just a glimpse before you clicked and committed yourself? Google has just turned on its new instant preview tool that let’s you get your sneak peak. Beside every listing in web search results — including local listing results — Google has inserted a magnifying glass icon . When you click on the icon, Google will display the top of the page it’s pointing to. Here’s an example of the instant preview showing Ozdachs’ home page. When you move your cursor through the results list, you’ll get previews of the pages under your cursor. Of course, the preview feature increases the need for your home page to be attractive and informative. You want people to want to see more! We’ll also have to explore the effect instant preview will have on hit tracking. Maybe there will be fewer people who “bounce” (go to just one page and leave) on your site. Maybe your overall number of visitors will decrease because folks will decide not to explore your site when they see a preview. Lots of questions, but this Google feature is just out the door. So, for now, try it out in your browsing and see how you use it. When you have a feel for the power of the instant preview you can talk intelligently to your web designer about any changes you may want to make to your site.